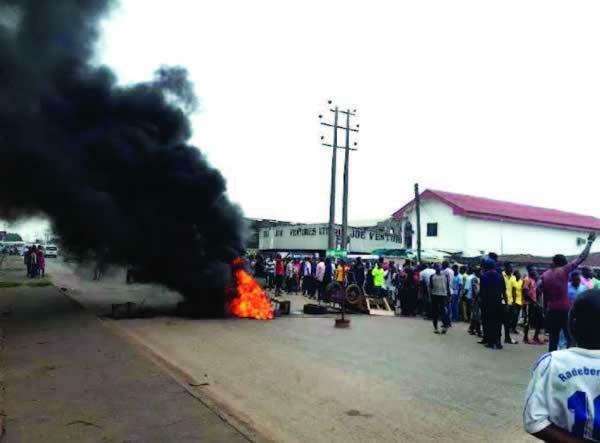 Angry youths on Friday protested against the death of a middle-aged woman after she was allegedly died during "controversial" s*x with an employee of the Public Works Volunteers in Benin, Edo State. Ramat Park axis, along the Benin-Agbor Road, in the Ikpoba-Okha Local Government Area of the state, on Thursday. While some of them claimed that she was r*ped to death, others alleged that she was used for money rituals. Southern City News gathered that the deceased was allegedly accosted by the suspect, identified as one Fred and also known as Biggie, at about 8:30pm and taken to a room where he allegedly had s*xual inter-course with her. Magdalene was said to have rushed out of the room n*ked and called for help before she slumped openly with no clothes on. The suspect was said to have later fled the scene for fear of being identified as more people gathered to see what had gone wrong. The source said, “The name of the man (suspect) is Fred. The man went inside a room with the woman at about 8:30pm. About one hour later, the woman suddenly ran out n*ked and shouted for help, complaining that she did not understand what was happening to her. “The neighbours came and covered her n*kedness before she fainted. When some drivers wanted to take her to a hospital, the man refused, claiming that the woman was his elder sister.